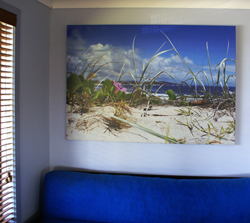 We specialise in large format, vibrant prints. Our hardware includes a six colour Roland XC540V Pro III digital printer, capable of printing stunning graphics up to 1340mm wide. This state of the art printer is capable of printing on a huge range of papers, vinyls and fabrics - opening the way to endless possibilities for a multitude of display options. With an emphasis on quality, we believe that good colour management is an essential element of the printing process. Your business image can be destroyed when the burgundy you like so much in your logo has become red on your vehicle signage, brown on your point of sale marketing, and dark pink on your promotional banner. Digital printing continues to evolve at a rapid rate. Ever increasing computing power, high tech fast printers with new vibrant eco inks all combine to offer you a range of exciting large format branding and display solutions. Our modern digital printer is capable of producing fabulous visual diplays on banners, adhesive vinyls, posters, wallpapers, art papers, canvas and many types of fabric. Leading media manufacturers like 3M and Avery are constantly improving the quality and range of specialty substrates available. They have even developed a vinyl system that trained appllicators can wrap onto brickwork walls, pavements and other textured surfaces. Lamination is offered as an option on most of our vinyl stock. This is ideal for extending the life of the print, particularly if it's used outdoors or in high traffic areas. The Roland XC540V is an integrated print and cut machine, meaning the printed graphic can be cut out in any shape you may require. This feature is particularly useful for economical production of printed wall and vehicle decals, along with custom stickers and labels. the selection of an appropriate media profile and colour management preset - this is essential. To ensure efficient matching and reproduction of colour we make use of “the Roland colour matching system”. 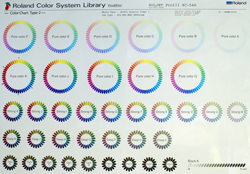 Roland Colour Library has over 1000 spot colours that we can provide as swatches across our range of print media. 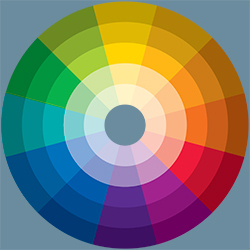 Often, to attain the best match, it is necessary to tweak colour values of the colour swatches in the original design application. 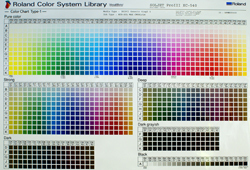 It is true that colour management is one of the most challenging aspects of quality digital printing. Even after all our attention to detail, we still insist on providing final proofs for our clients to ensure 100% satisfaction and no nasty surprises. 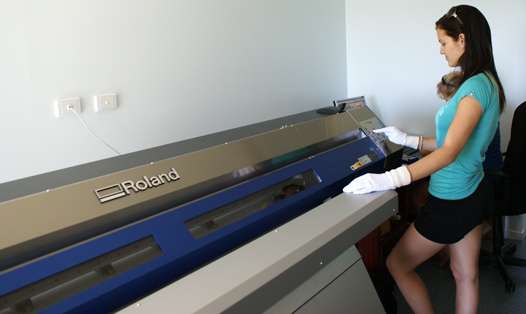 For our in-house printer we choose to operate the state of the art reel to reel Roland XC540V. 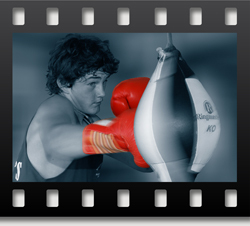 It has the ability to produce stunning, high resolution images on a huge selection of media types. The six colour eco solvent inkset includes the traditional CMYK, with the addition of Light Cyan and Light Magenta. The available colour gamut is therefore expanded and is particularly effective in providing subtle improvements in fine colour work for photographic reproduction and, in particular, skin tones.